SHYAM means the GOD SHREE KRISHNA. Established in 1990, Shyam corporation is a fast-growing Diamond Manufacturing Company. Shyam corporation is one of the leading diamond companies in the world, give immense importance to our global client relations. Shyam corporation is managed by owner of Mr. Arjan bhai pansuriya. Mr.Suresh A Pansuriya. Mr.Yogesh A Pansuriya. Mr.Kishor A Pansuriya are dedicated to business since last 25 years . who envision the company to be one of the finest diamond manufacturing and marketing entities across the world. We believe in trustworthy and honest relationships with all our clients in order to ensure satisfactory customer service. As well as, we aim to establish long lasting relationship with our clients through mutual understanding and shared opportunity. Shyam corporation continually motivates and trains all its employees for providing value added services to members and continually improve the quality management system. We employee 250 strength of workmen – specialized in the field of Marketing, Sales, Inventory, Accounts, Audits, HR and Admin. Shyam corporation committed to fostering and promoting the highest ideals of honesty and best practice principles throughout the diamond industry worldwide, as well as full compliance with all relevant national and international laws. The Company is in compliance with all international, national and local legislators governing the business of all types of diamonds. Our firm played a pivotal role in motivating the company to take on greater challenges and calculated business risks, ensuring a bright future and immense respect from his counterparts. Apart from doing Business, we understand our responsibility towards our society hence we contribute to the society by giving donations to different NGO's work in the areas of Education, under privileged and blood bank etc. Assuring you consistent supply of large - sized diamonds at best competitive prices. This is the most popular cut for diamonds today, and also the most dazzling. In jewellery such as engagement rings, where only one stone is used, it allows the single gem to shine brightly enough to make a statement without accompaniment. It also adds brilliance to lower-grade diamonds, making it an ideal choice for those on a budget. The marquise cut is ideal for those looking for something a little different. An elegant boat-shaped cut, it is also known as the navette cut, from the French little boat. It stands out against the more typical round and square shapes of other stones, and gives an elegant flair to individual settings such as rings. When shopping for a marquise or navette-cut stone, be careful to avoid jewels with the bow-tie effect, caused when the shape of the diamond casts shadows on the main facet of the stone. However, a well-cut marquise diamond should not display this defect, and will look larger and more dramatic than differently-cut stones of the same carat weight. A pear cut is one of the most difficult for jewellers to produce, and is therefore a real showcase of skill and quality. It combines the brilliance of round cuts with the unique elegance of the marquise. Adding a cleft in the top of a pear cut produces a diamond shaped like a heart, a charming and romantic shape suitable for pendants and earrings. The ideal heart cut diamond is not too flat, as this can dull the brilliance of the stone. Larger diamonds are also preferable, so that the shape can be clearly seen. What is a Diamond Carat Weight? Finally in the Diamond 4 Cs, the carat will be factored into the equation. One carat is defined as one-fifth of a gram. It should be mentioned here that, contrary to popular belief, the carat does not refer to the size of the stone in question, but rather its exact weight. What is a Diamond Color? 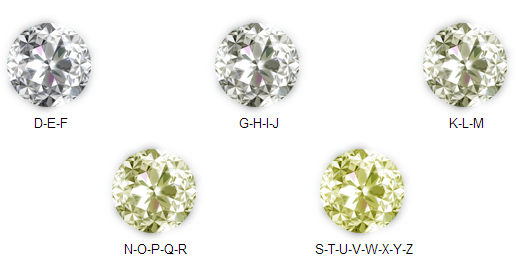 One of the most interesting and beautiful aspects of diamonds is that it can be found in a number of different hues. This natural colouration is caused by other minerals which may have dissolved into the matrix during the stone’s natural formation process. Some examples are yellow, green, purple, blue and even pink. Certain colours - such as a deep violet or a rich yellow are much rarer and thus, the diamond value of these colours is significantly more. For engagement rings, a pure white or colourless hue is favoured, and rank along their own diamond quality chart from D – Z, with D being the most valuable and clearest of colour, and Z featuring visible yellow colouring. Flawless diamonds have no external or internal flaws and as such are the most sought after, highest valued stones available. Very, very slightly included diamonds have defects, however these are considered small enough that detection under 10X magnification is difficult. The diamond rank of Very slightly included refers to stones with defects that are difficult to spot with the naked eye. Stones which fall under Slightly included on the diamond chart will have imperfections that can be scrutinised with the naked eye. Included diamonds are those with the most internal and external flaws. As suggested by the extensiveness of the diamond clarity chart, the highest diamond rank of "Flawless" is therefore the highest in terms of price. Many consumers instead opt for stones with slight inclusions (Sl1, Sl2 or Sl3) which, beyond the grading of diamond charts, are suitable quality for many common jewellery applications. This is also an excellent alternative for anyone who desires a larger stone without hampering their budget. Those who are concerned about imperfections which can be visible to the naked eye should instead choose diamonds with very slight inclusions (VS1, VS2). Diamond cuts - what makes a diamond sparkle? The beauty and desirability of diamonds comes from their eye-catching sparkle, achieved by careful handling by an expert artisan. A gemstone that does not glisten is hardly deserving of such a name, so precisely what makes a diamond sparkle? It is the diamond cut which determines how the stone reflects light, and therefore give a truly brilliant sparkle. Known in the industry as ‘fire’, referring to the coloured light reflected, and ‘brilliance’ for the uncoloured light, optimum levels of sparkle can be achieved only through a supremely executed cut. Though diamond cutting can be traced back to the Middle Ages, it wasn't until the late 1400s that the importance of total symmetry to reflect light was realised, and the development of tools to cut them improved. Not until the 1900s was a diamond cut so well it sparkled in the way we expect today. It was mathematician and engineer Marcel Tolkowsky, coming from a family of jewellers, who crafted a near perfect cut. With 57 facets positioned at 45-degree angles, it created brilliance and fire, and the greatest sparkle, setting the standard for all future diamond cuts. Today, with the aid of precision tools like lasers, cutting diamonds is easier, quicker, and with an endless choice of shapes and cuts. However, old rules apply. If cut too shallow, light reflects beneath; too deep and the stone reflects sideways. For example, the best cut for a dazzling engagement ring will result in the highest percentage return of white light and the ring will sparkle from the front, known as the crown, regardless of how light hits it. A cutter chooses the shape and cut of each diamond based on its original rough shape. Their task is to maintain its carat weight (avoiding wastage) while creating the best possible sparkle. Even with the best tools, creating the perfect cut isn't easy, thus why diamonds differ in quality and price. Two of the same shape, colour, clarity and carat diamond can have a 40% price difference due to cut. More sparkle often means more money, however some people care more about weight and size rather than cut, ultimately it comes down to price and preference. As a quick guide, below are the commonly used different diamond cuts with their ability to reflect light and provide sparkle given in percentages. We'll class the round brilliant cut at 100%, but no diamond is realistically so perfect. Favoured in engagement rings and jewellery where the gemstone is given centre stage. Oval cuts seek to mimic the same brilliance and fire created by a round cut, with the added benefit of appearing larger due to its length. Sparkle is around 90%. Of similar levels is the pear cut, where its rounded edge preserves the high levels of sparkle. Heart cuts give approximately 80% sparkle and create a unique statement piece where this high level of brilliance is crucial. The princess cut will give 70% sparkle and lose the rounded shape that provides the highest levels of brilliance, however, its large crown can give the illusion of a greater size. Cushion cut diamonds provide 60% sparkle and give a distinctive light pattern due to their mix of rounded and straight edges. 60% sparkle is provided by emerald cut diamonds which give less fire but a unique type of sparkle which interplays the light and dark planes of the step-cut stone. The baguette cut will give 45% sparkle and is similar to an emerald cut without the rounded edges, as such, this removes the potential for sparkle that smoothed edges provide. Choosing the best cut you can afford is the best way to ensure you achieve the most sparkle for your money, though personal preference may mean your desired shape equals less sparkle. © 2019 by Shyam Corporation. All Rights Reserved. Site By Lemon Technologies Pvt. Ltd.